When he was Batman, Bruce Wayne was the master strategist of the Justice League. No one on DC’s premier superhero team was smarter than him. But Bruce Wayne can’t be the Dark Knight anymore. The World’s Greatest Superheroes want to make sure. A little magic lasso won’t hurt him, right? Things have changed in the Bat-titles. Bruce Wayne survived a near-death experience as Batman, only to return to consciousness without the memory, training or traumatic impetus that allowed him to be the Dark Knight. His successor is Jim Gordon, the former-commissioner-but-still-a-cop who’s undergone extensive training to wear a 10-foot corporate-built robot Batsuit. 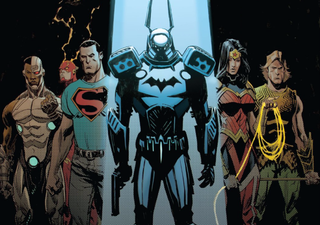 In the months since these changes, the new status quo has been trickling out into the DC Universe, with various partners, friends and Bat-family members encountering the changes in entertaining or poignant ways. This week in Detective Comics #45—by Peter Tomasi, Marcio Takara, Chris Sootmayor and Wes Abbott—it’s the Justice League’s turn. When mysterious doings rob dozens of innocents of their lives, Bruce’s former teammates show up at Wayne Manor. Despite having already heard about the former Caped Crusader’s un-Batman-ness from Superman, the League is desperate to see if his genius is truly lost. Alfred tries to tell them that it is but they need to see for themselves. And Superman thanking him for his service without being able to explicitly say what it was. Later in the issue, brainwashed fighter pilots attack Gotham, leading to a team-up between the new Batman and the League. Gordon isn’t icily aloof like his predecessor; he’s wowed at fighting alongside Superman and the rest of the team. But he still balks when asked to join them. When Wonder Woman argues that he’s still more of a detective than anyone else on the team, Gordon relents and joins up. So, now the newest version of one of DC’s oldest characters is now a rookie on the Justice League. All of this is a sea change from previous iterations of the Batman/Justice League dynamic. Before the 2011 New 52 reboot, a storyline called Tower of Babel revealed that Batman had a contingency plan to take out the entire League if they ever went rogue. (That plan wound up in the hands of Ra’s Al Ghul, who used it, of course.) That arc exemplified the latter-day distrust that’s been the hallmark of the Batman/Justice League dynamic. Over the last few decades, it was a familiar story beat to have Bruce growl about how the League was too frighteningly powerful. Now, both the Batman who’s on the Justice League and the one who was on the team before both agree that the super-team is an admirable collective.